These opinions are disavowed as being product claims or labeling and are presented only for the purpose of sharing experiences and opinion—in the hopes of stimulating each person’s further research and in the hopes of increasing awareness and understanding of how Parent Essential Oils affect cell oxygen content and overall health. They are specifically disclaimed as being typical results. They are not endorsed by the owners of this website. They are are just opinion of those expressing them. 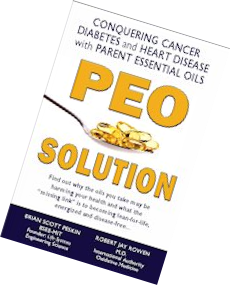 Many of these endorsements are the result of reviewing the scientific studies/patient outcomes in the book PEO Solution (shown to the right). These physician experiences and opinions are not verified by the owners of this web site and may be subject to errors of interpretation by these cited individuals. We do not guarantee these physician opinions to be accurate. Therefore, these statements must not be relied upon in predicting the results of anyone else.